In a Nosegrind, the skateboard’s front truck grinds a rail or edge, while the back truck is suspended over the rail/edge. 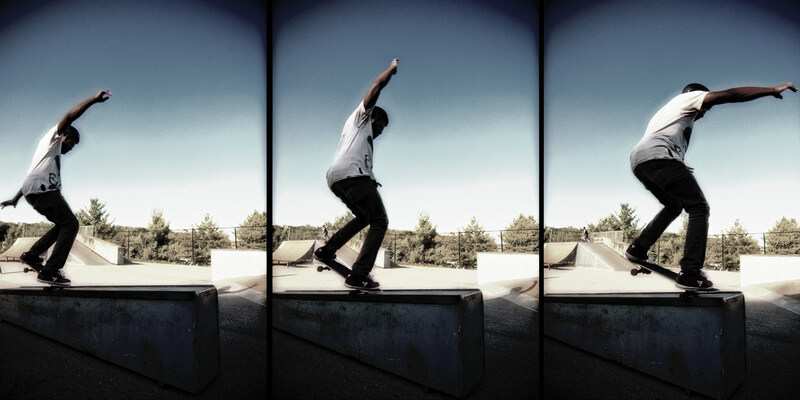 It is similar to the nose manual, except performed on a rail, coping, or ledge. Jamie Thomas is one of the few people who can balance a legitimate nosegrind down a lengthy handrail. Front foot set up like it would be for most grinds. Closer to the nose than usual to help you land balanced, but also giving yourself enough room to get a high enough ollie to get onto whatever the object is you’re wanting to grind. Back foot set up similar to the set up you’d use to get into most grinds. A set up that will give you a solid pop and allow you to land balanced.